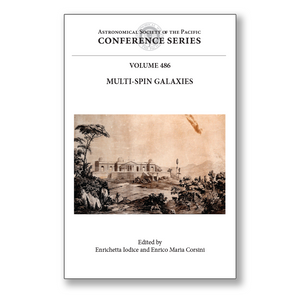 Editor(s): Iodice, E.; Corsini, E. M.
This volume contains the proceedings of an international conference organized by the INAF-Astronomical Observatory of Capodimonte and the Department of Physics and Astronomy of the University of Padua. The conference was held in Naples at the Astronomical Observatory of Capodimonte, which is part of the Italian National Institute for Astrophysics (INAF). The main purpose of the conference was to discuss the current observational and theoretical understanding of the origin and evolution of the angular momentum decoupling in multi-spin galaxies. This class of objects includes galaxies with extended polar rings and disks, inner polar disks, low-inclination rings, kinematically decoupled cores, and extended counter-rotating components. The observed phenomenon of warped gaseous and stellar disks is yet another example of misalignment between various rotating components in a galaxy. The scientific program of the conference, which included 37 talks and 12 poster contributions, focused on the following topics: (1) the observed properties of multi-spin galaxies at low and high redshift, including studies of the Milky Way as a multi-spin system; (2) the structure and formation of the decoupled angular momentum components in galaxies; and (3) the kinematics and dynamics of multi-spin galaxies. This volume will provide extragalactic astronomers with an overview of the most significant results of the last decade in this field.